A man holds a sign in protest of a planned natural gas pipeline, during a community meeting at the Wimberley Community Center on Tuesday. 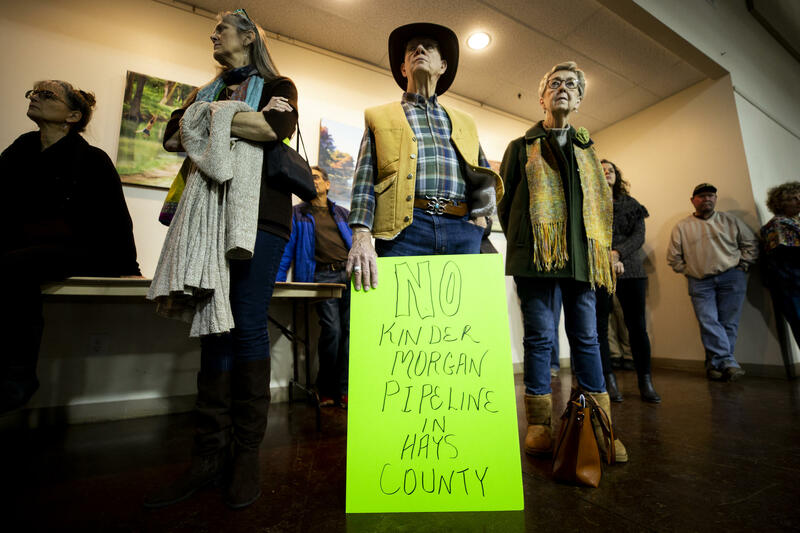 A public meeting Tuesday on a planned natural gas pipeline in Central Texas often felt more like a protest, as Hays County residents shared concerns about the project and speakers vowed to fight it. Attendees filled the Wimberley Community Center ballroom beyond capacity, with more than 200 people in the main room and dozens of others crowded in the lobby. They were there to hear from elected officials, lawyers and environmental experts. But many also brought petitions and some held up posters opposing the project. “My family is prepared to fight this pipeline with all of our resources,” former Kyle Mayor Lucy Johnson, whose family owns two ranches in Hays County, said to loud applause. The $2 billion, 430-mile long pipeline is planned to bring natural gas from the Permian Basin of West Texas through the Hill Country to the Gulf Coast, where it could be used domestically or exported. Lawyers advised property owners on how best to strengthen their hand in negotiating with pipeline company Kinder Morgan. Environmental experts warned of the potential adverse impacts the pipeline could have on land and groundwater in the region. “A lot of these questions would be answered with an environmental impact analysis, which would be required if this pipeline was crossing state lines,” said Blayne Stansberry, president of the Barton Springs Edwards Aquifer Conservation District. “I would assume that Kinder Morgan, being as large as they are, knows the people to hire to do a study, so that would be one thing I would expect," Stansberry said. At times the most vocal disagreements appeared to be between people who oppose the pipeline unconditionally and those who simply want it re-routed away from their communities. By the end of the night, attendees had submitted so many questions and concerns that the county natural resources manager, Alexandra Thompson, didn’t have time to collate them all as she read them back to the crowd. “That’s as far as I got,” she said to laughter after about two minutes of reading. Ken Spedman (center) and Deborah Spedman (right) were among those at a meeting in Wimberley on Tuesday who expressed opposition to the pipeline project. The concerns touched on everything from noise pollution to private property rights. State Rep. Erin Zwiener, D-Driftwood, said the meeting highlighted the need to overhaul how pipeline companies use eminent domain in Texas. Republican Hays County Commissioner Lon Shell said he hopes Kinder Morgan will be able to address the questions raised in public meetings planned for February. "[There was a] lot of passion in the room tonight, we appreciate and respect that, but I think there can be a dialogue moving forward that can be productive,” said Allen Fore, a vice president of public affairs with Kinder Morgan, who attended the event. The company plans to start construction of the pipeline this fall and have natural gas flowing in late 2020. A fight over a pipeline is never only about the pipeline. It’s about the environment, property rights, public safety and a community’s sense of itself. Just such a fight is now brewing in the Texas Hill Country, where company Kinder Morgan plans to lay a part of its 430-mile natural gas Permian Highway Pipeline. Take a handful of sprawling cities and growing populations that are expanding into once-rural areas, add a booming oil and gas industry with a desperate need for new pipelines to move record-high volumes of hydrocarbons, and sprinkle in the new electric lines needed to power both of those trends. There’s almost enough pipeline transporting crude oil and other chemicals buried under Texas to reach the moon and back. Last week, one small section of that infrastructure in Bastrop County was damaged by a maintenance crew. The result was a spill of more than 50,000 gallons of crude oil. Texas is not a state known for strong environmental protections. The fact is, many green groups head into legislative sessions more concerned about stopping bills that might do harm than supporting bills that might help.